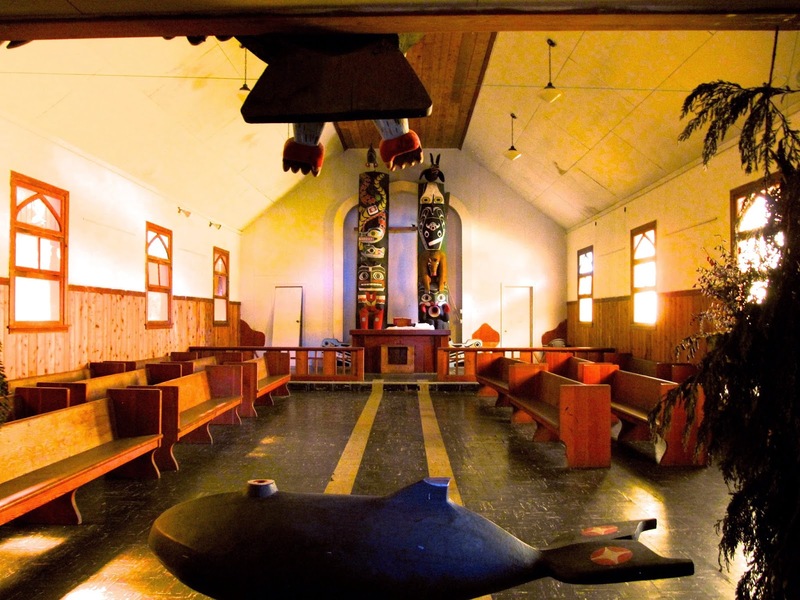 The hall itself, I am pleased to say, has been reclaimed by the First People of Yuquot. 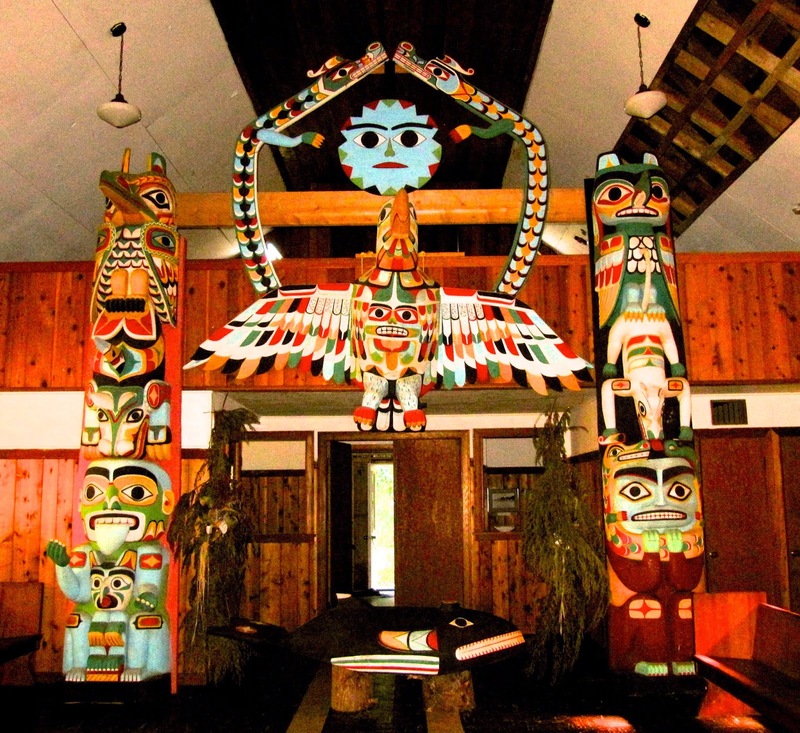 Their art, their totems, and their symbols now inhabit this space. The only symbol that remains of the Spanish church, apart from the cross atop the steeple, is the large Latin/English bible that rests on a wooden table. Flanking the table are carved and painted poles. The historical presence at Yuquot was rather brief, yet remarkably intense. In the 1780s, Nootka Sound was the most important anchorage on the Pacific Northwest coast--contested space, sought by Russia, Britain, and Spain. Thousands of Nuu-chah-nulth families lived here in scattered communities, as their people had for millennia. Of course, that didn't stop the Europeans from trying to "claim" the territory or exploit the people for their resources. It never did. In 1788, John Meares, a Brit, builds and launches--with the help of many Chinese workers--a 50 ton barque, North West America, in the cove, west of the village. 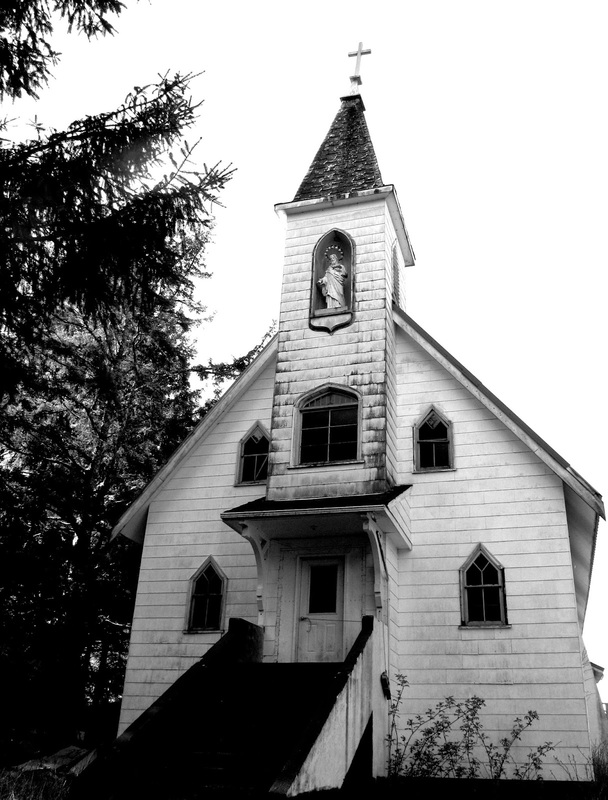 (The first Spanish church is later built there.) Martinez, who has established a fortified post in Friendly Cove, seizes the ship, along with three others: Iphegenia, Argonaut, and Princess Royal, and sends them off to San Blas, Mexico (the centre for Spanish operations). During one skirmish, Maquinna’s relative, Callicum is shot and killed--again, this involves Martinez. As tensions escalate, Martinez requests 200 infantry. Before they can arrive; however, he abandons Nootka Sound. With no Internet, this news does not reach anyone of consequence. 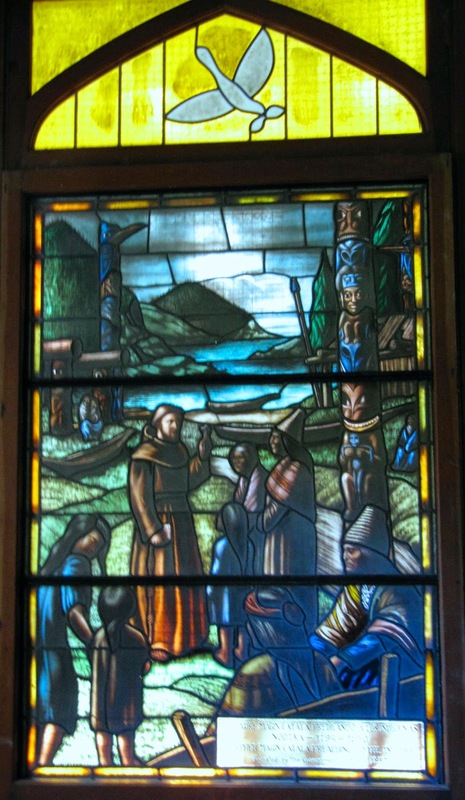 The King of Spain had issued a Royal Order on April 14, 1789, requiring the establishment at Nootka to be maintained. So, Flores, the Viceroy of New Spain orders the First Free Company of Volunteers of Catalonia, under Alberni, to move north. In 1790, Alberni’s soldiers reoccupy the fort, under the command of Eliza. The Catalonians rebuild and enlarge Fort San Miguel, and the settlement, Santa Cruz de Nuca. Things stabilize somewhat. Maquinna’s trust is regained, and trading goes on. 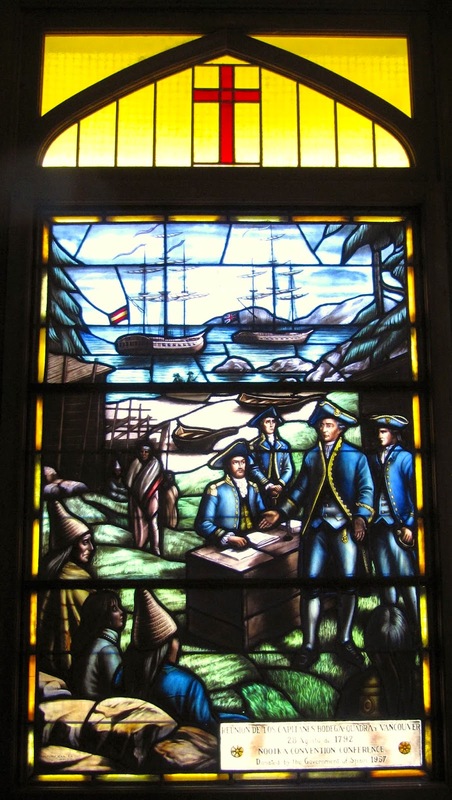 In 1792, Quadra is sent to command the base and the famous Nootka Convention Treaty (mentioned on the plaque) is signed with the British. George Vancouver represents England. Santa Cruz de Nuca has barracks, a hospital, and fantastic gardens. 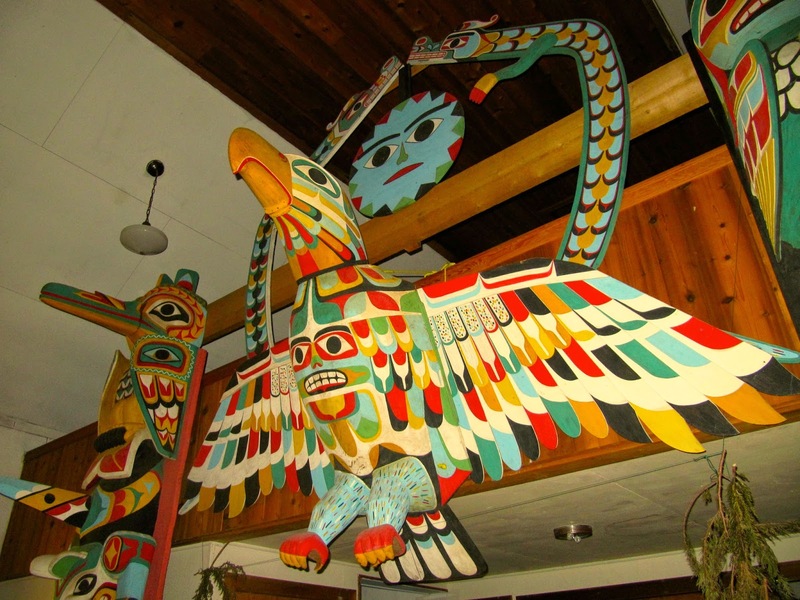 Quadra is respected by the Yuquot people; in fact, Maquinna often stays overnight at Quadra’s residence, and enjoys his famous silver plate banquets, wines, and brandies. Life is good. The first missionary, El Padre Magin Catala, arrives in 1794, and assimilation commences. But, within three years, the Europeans abandoned Nootka Sound. Maquinna tore down the fort. What followed for the people of Yuquot was a time of tension and declining wealth, due to the lessening fur trade. 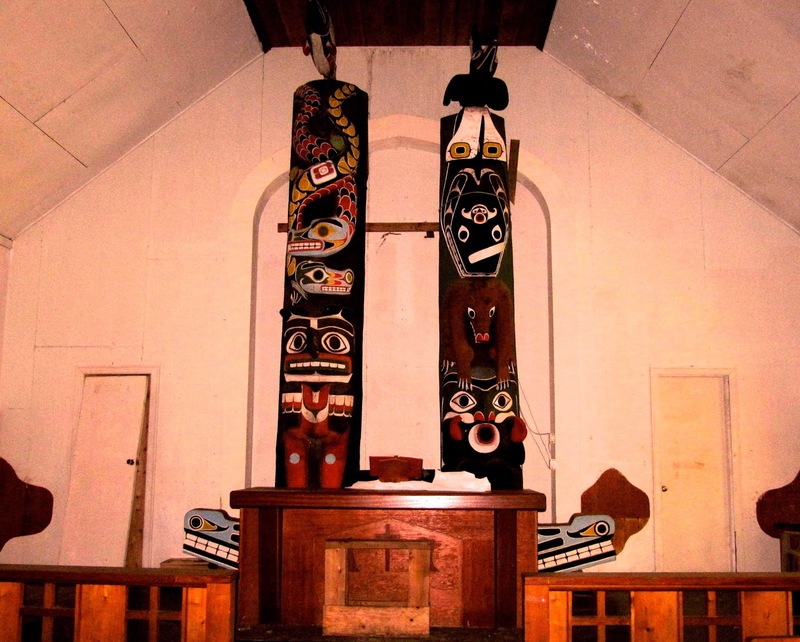 At the back of the church, carvings hang from the ceiling, a testament to Nuu-chah-nulth reclamation. The eagle resembles the carving that adorned Chief Maquinna's burial site (1902). The church/museum feels lonely this time of year. Come summer, when hikers hit the Nootka Trail and the Uchuck III begins its tours from Gold River, it will fill occasionally with curious tourists. The old buildings have sunk into the moss, and the people have all but gone. I wish I could hear them...singing, dancing, laughing, explaining what all of this means, and telling their story of this place.